What are the classic beers that are yet to be bettered? 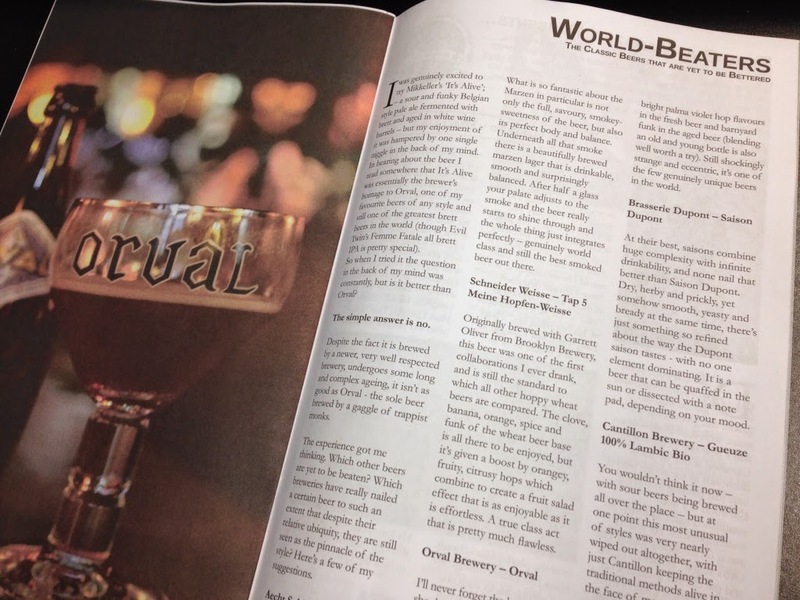 I wrote another piece for Ferment Magazine recently on beers which have really stood the test of time, and which, to my mind at least, are still yet to be bettered. Beers like Orval, Cantillon Gueuze and Meine Hopfenweisse, which have nailed a style to such an extent that it is difficult to see them ever being improved upon. But did I miss some beers from the list? Certainly this post over on Fuggled had me thinking Pilsner Urquell (at least the unpasteurised, unfiltered version) deserves a place. The pints of Tankovna PU I’ve drank in the Sloaney Pony, aka The White Horse on Parson’s Green, have done nothing but reaffirm my thought that this really is a special beer (I can only imagine how good the tank beer round the corner from the brewery tastes). Rounded with malt and caramel from the direct flame coppers, yet with a punchy, herby, bracing bitterness from all that saaz. A pint disappears before your eyes at an alarming rate. When writing the article – reproduced below for those that are interested – I was certainly mindful of the fact I hadn’t included any British beers. The only beer which I think has achieved such legendary, unbeatabler status – in my beer cupboard at least – is Fuller’s Vintage Ale. In the end I decided it wasn’t specific enough for the article, but maybe I was wrong. I’m yet to taste a British beer that ages better than Vintage Ale, though Harvey’s Imperial Extra Double Stout comes a close second – though for very different reasons, with all it’s brett-like funk. So my question is simple. What did I miss out of the below? What classic beers are yet to be bettered within their style? I was genuinely excited to try Mikkeller’s “It’s Alive” - a sour and funky Belgian style pale ale fermented with brett and aged in white wine barrels – but my enjoyment of it was hampered by one single niggle in the back of my mind. In hearing about the beer I read somewhere that It’s Alive was essentially the brewer’s homage to Orval, one of my favourite beers of any style and still one of the greatest brett beers in the world (though Evil Twin’s Femme Fatale all brett IPA is pretty special). So when I tried it the question in the back of my mind was constantly, but is it better than Orval? The simple answer, is no. Despite the fact it is brewed by a newer, very well respected brewery, undergoes some long and complex ageing, it isn’t as good as Orval - the sole beer brewed by a gaggle of trappist monks. The experience got me thinking. Which other beers are yet to be beaten? Which breweries have really nailed a certain beer to such an extent that despite their relative ubiquity, they are still seen as the pinnacle of the style? Here’s a few of my suggestions. When it comes to smoked beers there is only one brewery that comes to mind: Aecht Schlenkerla in Bamberg. What is so fantastic about the Marzen in particular is not only the full, savoury, smokey-sweetness of the beer, but also its perfect body and balance. Underneath all that smoke there is a beautifully brewed marzen lager that is drinkable, smooth and surprisingly balanced. After half a glass your palate adjusts to the smoke and the beer really starts to shine through and the whole thing just integrates perfectly – genuinely world class and still the best smoked beer out there. Originally brewed with Garrett Oliver from Brooklyn brewery, this beer was one of the first collaborations I ever drank, and is still the standard to which all other hoppy wheat beers are compared. The clove, banana, orange, spice and funk of the wheat beer base is all there to be enjoyed, but it’s given a boost by orangey, fruity, citrusy hops which combine to create a fruit salad affect that is as enjoyable as it is effortless. A true class act that is pretty much flawless. I’ll never forget the look of shock on Matt - the manager of the excellent North Bar in Leeds’ - face when I told him many years ago I’d never tried Orval. It was, and still is, his favourite beer. We spent the next few hours drinking bottles of various ages and I was instantly hooked on the combination of bright palma violet hop flavours in the fresh beer and barnyard funk in the aged beer (blending an old and young bottle is also well worth a try). Still shockingly strange and eccentric, it’s one of the few genuinely unique beers in the world. At their best, saison’s combine huge complexity with infinite drinkability, and none nail that better than Saison Dupont. Dry, herby and prickly, yet somehow smooth, yeasty and bready at the same time, there’s just something so refined about the way the Dupont saison tastes - with no one element dominating. It is a beer that can be quaffed in the sun or dissected with a note pad, depending on your mood. You wouldn’t think it now - with sour beers being brewed all over the place - but at one point this most unusual of styles was very nearly wiped out altogether, with just Cantillon keeping the traditional methods alive in the face of mounting pressure and changing tastes. You can taste that commitment in the fiercely tart, lemon-pith-like gueuze brewed by Cantillon, which is still one of the finest sour beers in the world. A few more spring to mind; Augustiner Helles, Duvel, Karmeliet Tripel, Fullers ESB, Pliny The Elder... I'm sure I could think of even more if I put my mind to it. Agree with all of your choices above bar perhaps Meine Hopfenweisse, it's a modern classic, yes but is it more so than Schneider's classic Weissebier? I don't think so. I thought about Pliny the Elder but unfrotunately I've never tried it. Can't agree Karmeliet - I think there are better Tripel's out there. I take the point on Schneider. Though I have a big soft spot for Rothaus and Franzikaner so I don't thing as Tap 7 as being unbeaten in the same way as Hopfenweisse. Yes, I'm always a little surprised by the Tripel Karmeliet fan base in the UK blogosphere. As you say there are plenty better out there - off the top of my head St Feuillien Triple and De La Senne Jambe de Bois easily knock it into a cocked hat (as arguably does good old Westmalle on a good day). What can I say, I'm a huge fan! Have you tried many others?